Essential Oils and Aromatherapy is a powerful, natural, plant-based approach to wellness. Sublime Naturals manufactures therapeutic-grade oils and blends, and offers a Subscription Box + One-A-Month Club for enthusiasts. Build a stronger immune system and stay well with Immune Boost Essential Oils Blends. Staying well and building a stronger immune system against assaults by bacteria and germs in on the mind of many. Using natural essential oils to kill bacteria, purify the air, build and support the immune system is a smart addition to daily wellness. Simply inhale and then place drops on the neck, wrists and feet. Some apply it to the feet each night at bedtime. 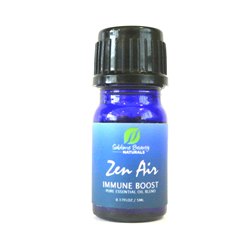 This week, a NEW non-topical pure blend (that is, intended for diffusion or inhalation - or add drops to a favorite oil or cream for topical use) is the ZEN AIR IMMUNE BOOST. It includes the same ingredients listed above except for the organic jojoba and sunflower. This blend can be added to a diffuser, an inhaler or simply inhaled from the bottle. A few drops can be added to a favorite oil or cream for topical use. ABOUT SUBLIME NATURALS: Sublime Beauty Naturals offers essential oils and organic products for wellness. The founder, Kathy Heshelow, is author of "Essential Oils Have Super Powers: From Solving Everyday Wellness Problems to Taking on Super Bugs". Many products are available on Amazon, and all are on the Sublime Naturals store. Sublime also offers ZEN BOX, a subscription box of essential oils and the One-a-Month Essential Oil Club.